A weekend off to the Southern British coast for me and Marcella, visiting a good friend talking about new blog, and the project of connecting the world of hospitality with DedYcated, so we shared ideas with our unique friend Maurizio Mele, a young lad born in Sardinia and met in London few years ago, a colleague involved as us in hotels and bars, he’s now spending his last days in Britain, before leaving to his new venture on his mother town where he will start his own street-local-food on four wheels for the summer season. He knows very well how much we love talking about local traditions, so he started his beautiful tales about his time in Turkey, while studying for his graduation… couple of cups of teas, and we decide to write a new article sharing his experience… featuring Turkish local hospitality at the Gran Bazar. <<The ability of the Turkish dealers inside the Gran Bazaar to attract the attention of the travellers, is mesmerising… talking in every language known in the mediterranean, and further. Communication for them is an Expertise that they have learnt with the only purpose of socialising. Selling is an art here, and it happens in a unique style approaching their guests cheering in native language and leading them to their small corner among the 4000 others, in this ancient building built in 1400. all of them teasing you with body language and eye contact, offering the very best products such as foods, teas, carpets, fabrics… the art of the haggle is in their dna from centuries, being in the centre of the crossroad of goods and commerce for a long time, through exchanges and merchants that arrived from the farer eastern Asia, but also from Venice and the whole Mediterranean. <<A genuine and true cordiality in the Turkish people blood, it will remain forever in my memory. I remember with pleasure when in the shop of the carpets of the Gran Bazar, I was welcomed with the warmest manners, and I was offered their natural tea pots, arranged on the carpets, tea varieties were served to you in pistils, with one or two cubes of sugar, magic and characteristic moment that blended with the smokes and musics surrounding us, I had the honour to try the local typical mixture of tea and fruit called “Elma Cay” based of green apples from a sourer taste, their perfume flooded the air and magically mixed him with that incense and that aroma of leather, genuine humidity of those centuries old bricks. Astonished I was when they showed me the tall containers where they do boil the teas, vapours fly in the area and Create another perfume that involves you in the theatrical place. 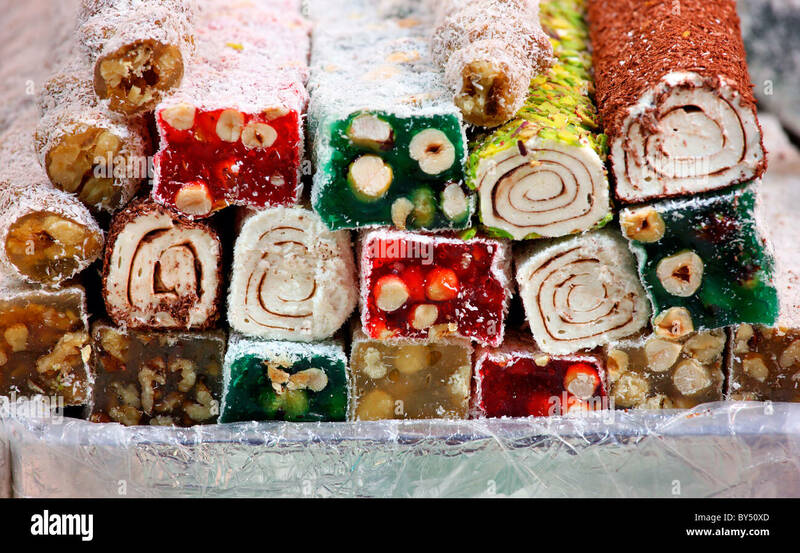 The tea drink is served with coloured and aromatic sweets of the type “Locum, sweets shaped and sized like a little bar, cut in oblique, made by starch, icing sugar and walnut inside the stuffing. 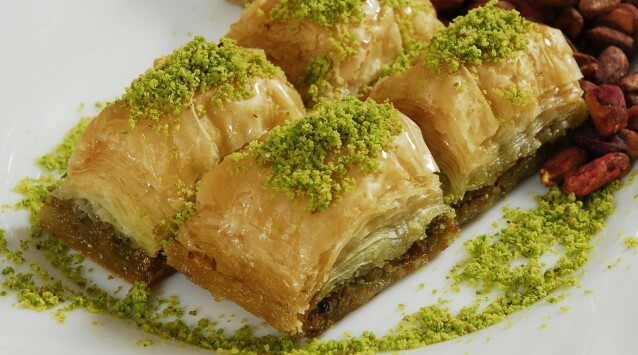 The “Baklava” instead based of honey and rose water, crumble of walnuts, molasses pistachios and cinnamon. in alternative the Simit was offered remembering the form of the pretzel but slightly sweetened. …sale was not fundamental in first place for the dealers of the Gran bazaar, it seems to me very clever that their true interest is in the pleasure to entertain you in their corners, to make you see what they expose and they deal, maintaining the focus on the experience of the communication with the tourist and with the occasional client, therefore building a relationship and to try to make him feel well and eventually if possible, to deal and buy. I have a doubt, have we Italians learnt the art of hospitality and sale, along with capability of trading from the Turkish? This is a true possibility! ← “Straight-up” tips to save our planet! I think you may want to change the title word to traders.